For the film, see Police Officer (film). For other uses, see Policeman (disambiguation). The word police comes from the Greek politeia meaning government, which came to mean its civil administration. Police officers are those empowered by government to enforce the laws it creates. In The Federalist Papers (#51), James Madison wrote "If men were pure, no government would be necessary. "These words apply to those who serve government, including police. The more general term for the function is law enforcement officer or peace officer. A sheriff is typically the top police officer of a county, with that word coming from the person enforcing law over a shire. A person who has been deputized to serve the function of the sheriff is referred to as the deputy. A common nickname for a police officer is cop. The term copper is originally used in Britain to mean "someone who captures". (In British English the term Cop is recorded (Shorter Oxford Dictionary) in the sense of 'To Capture' from 1704, derived from the Latin 'Capere' via the Old French 'Caper'.) The common myth is that it's a term referring to the police officer's buttons which are made of copper. The term County Mountie is used specifically in reference to county police officers or county sheriff's deputies in the United States. 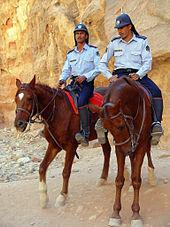 As with Canadian Mounties, the term mountie comes from police who serve while mounted on horseback (see cavalry). Responsibilities of a police officer are varied, and may differ greatly from within one political context to another. Typical duties relate to keeping the peace, law enforcement, protection of people and property and the investigation of crimes. Officers are expected to respond to a variety of situations that may arise while they are on duty. Rules and guidelines dictate how an officer should behave within the community, and in many contexts, restrictions are placed on what the uniformed officer wears. In some countries, rules and procedures dictate that a police officer is obliged to intervene in a criminal incident, even if they are off-duty. Police officers in nearly all countries retain their lawful powers while off duty. In the majority of Western legal systems, the major role of the police is to maintain order, keeping the peace through surveillance of the public, and the subsequent reporting and apprehension of suspected violators of the law. They also function to discourage crimes through high-visibility policing, and most police forces have an investigative capability. Police have the legal authority to arrest and detain, usually granted by magistrates. Police officers also respond to emergency calls, along with routine community policing. Police are often used as an emergency service and may provide a public safety function at large gatherings, as well as in emergencies, disasters, search and rescue situations, and road traffic collisions. To provide a prompt response in emergencies, the police often coordinate their operations with fire and emergency medical services. In some countries, individuals serve jointly as police officers as well as firefighters (creating the role of fire police). In many countries, there is a common emergency service number that allows the police, firefighters, or medical services to be summoned to an emergency. Some countries, such as the United Kingdom have outlined command procedures, for the use in major emergencies or disorder. The Gold Silver Bronze command structure is a system set up to improve communications between ground-based officers and the control room, typically, Bronze Commander would be a senior officer on the ground, coordinating the efforts in the center of the emergency, Silver Commanders would be positioned in an 'Incident Control Room' erected to improve better communications at the scene, and a Gold Commander who would be in the Control Room. Police are also responsible for reprimanding minor offenders by issuing citations which typically may result in the imposition of fines, particularly for violations of traffic law. Traffic enforcement is often and effectively accomplished by police officers on motorcycles—called motor officers, these officers refer to the motorcycles they ride on duty as simply motors. Police are also trained to assist persons in distress, such as motorists whose car has broken down and people experiencing a medical emergency. Police are typically trained in basic first aid such as CPR. In most countries, candidates for the police force must have completed some formal education. Increasing numbers of people are joining the police force who possess tertiary education  and in response to this many police forces have developed a "fast-track" scheme whereby those with university degrees spend two to three years as a Constable before receiving promotion to higher ranks, such as Sergeants or Inspectors. (Officers who work within investigative divisions or plainclothes are not necessarily of a higher rank but merely have different duties.) Police officers are also recruited from those with experience in the military or security services. In the United States state laws may codify statewide qualification standards regarding age, education, criminal record, and training but in other places requirements are set by local police agencies. Each local Police agency has different requirements. Dependent upon each agency, but generally after completing two years of service, officers may apply for specialist positions, such as detective, police dog handler, mounted police officer, motorcycle officer, water police officer, or firearms officer (in countries where police are not routinely armed). In some countries, including Singapore, police ranks are supplemented through conscription, similar to national service in the military. Qualifications may thus be relaxed or enhanced depending on the target mix of conscripts. Conscripts face tougher physical requirements in areas such as eyesight, but minimum academic qualification requirements are less stringent. Some join as volunteers, again via differing qualification requirements. In some societies, police officers are paid relatively well compared to other occupations; their pay depends on what rank they are within their police force and how many years they have served. In the United States, a police officer's salary averaged $61,230 in 2015. In the United Kingdom for the year 2015–16 a police officer's average salary was £30,901. There are numerous issues affecting the safety and health of police officers, including line of duty deaths and occupational stress. Almost universally, police officers are authorized the use of force, up to and including deadly force, when acting in a law enforcement capacity. Although most law enforcement agencies follow some variant of the use of force continuum, where officers are only authorized the level of force required to match situational requirements, specific thresholds and responses vary between jurisdictions. While officers are trained to avoid excessive use of force, and may be held legally accountable for infractions, the variability of law enforcement and its dependence on human judgment have made the subject an area of controversy and research. In the performance of their duties, police officers may act unlawfully, either deliberately or as a result of errors in judgment. Police accountability efforts strive to protect citizens and their rights by ensuring legal and effective law enforcement conduct, while affording individual officers the required autonomy, protection, and discretion. As an example, the use of body-worn cameras has been shown to reduce both instances of misconduct and complaints against officers. ^ "Police ranks and pay in England and Wales". Police-information.co.uk. Retrieved 2010-05-22. ^ "Police rank structure and other information in Scotland". Scotland.gov.uk. 1994-12-31. Retrieved 2010-05-22. ^ Dulaney, W. Marvin (1996). Black Police in America. Indiana University Press. p. 21. ISBN 0-253-21040-2. ^ Partridge, Eric (1972). A Dictionary of Historical Slang. Penguin Books Ltd. ISBN 014051046X. ^ "Educational Requirements for Police Officers". education-portal.com. 2011. Retrieved June 24, 2011. ^ "Requirements to Become a Police Officer". ^ "What Is Tertiary Education?". ^ "Police Pay". Police-information.co.uk. Retrieved 2013-02-06. ^ "Police Officer Salary – Police Test Guide | Police Officer Test". Police Test Guide. Retrieved 2013-11-13. ^ "The Use-of-Force Continuum". Library of Congress. Library of Congress. 9 June 2015. Retrieved 19 May 2017. ^ "The Use-of-Force Continuum". National Institute of Justice. National Institute of Justice. 4 August 2009. Retrieved 19 May 2017. ^ Fryer, Roland G. Jr. (July 2016). "An Empirical Analysis of Racial Differences in Police Use of Force". Harvard University. Harvard University. Retrieved 19 May 2017. ^ Wittie, Mark Curtis (2011). "Police Use of Force" (PDF). West Texas A&M University. West Texas A&M University. Retrieved 19 May 2017. ^ "Use of Force". Bureau of Justice Statistics. Bureau of Justice Statistics. 19 May 2017. Retrieved 19 May 2017. ^ Taylor, E. (2016). "Lights, Camera, Redaction... Police Body-Worn Cameras: Autonomy, Discretion and Accountability". Surveillance & Society. 14: 131. Wikimedia Commons has media related to Police officers. This page was last edited on 21 April 2019, at 01:07 (UTC).